Follow our step-by-step, photo illustrated instructions to learn how to make this easy Sourdough Bread from scratch. Printable recipe included. Fresh homemade sourdough bread, made with a homemade starter. It’s easier than you think. 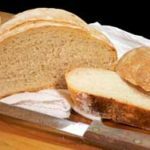 This recipe is a great introduction into making Sourdough Bread. It’s really easier to make than you might think. It just requires a little pre-planning and a little patience. Smile. You WILL need a “starter” to make this bread. I don’t have the step-by-step on how to make that posted here on Taste of Southern, but you can find it through a link that I’ve posted below for the King Arthur Flour website. It’s exactly what I used to make my sourdough starter. I must admit, I had to try several times to get a starter up and working. I tried several other recipes from videos that I watched online, but nothing worked for me until I tried the one listed with King Arthur Flour. Maybe I was doing something wrong with the others. I just don’t know. It was exciting though, that after working and feeding my starter for about 7 days, I finally had one that worked. You only have to work with it a few minutes a day, but once you get a starter going, it will keep going for many YEARS if you take care of it. The first day that I saw my starter almost over double in size, I was tickled pink. Then, I started storing it in the refrigerator and now I only feed it once a week. If all this is confusing to you, you’ll just need to do some homework to learn more than I can post here in one recipe for you. But, your efforts, and your patience, will be greatly rewarded when you see your first loaves fresh out of the oven and cooling on a wire rack. You might even be a bit “proud.” Smile. This particular version is adapted from a recipe from the King Arthur Flour website. Did you know they even offer a free chat service during the week so you can ask them questions about baking? I did that once, and the customer service was awesome. Thank you King Arthur Flour. They aren’t paying me for these plugs, but I’m thankful for their help and their products that allowed me to produce my first loaves of Sourdough Bread. I love just about all types of bread, and often buy Sourdough bread when I find fresh baked loaves at the markets. Trust me, it’s a whole lot cheaper to make it at home. Just saying. So, if you’re ready to give it a try, get that starter up and running. Then, come on back, head out to the kitchen, and… Let’s Get Cooking! 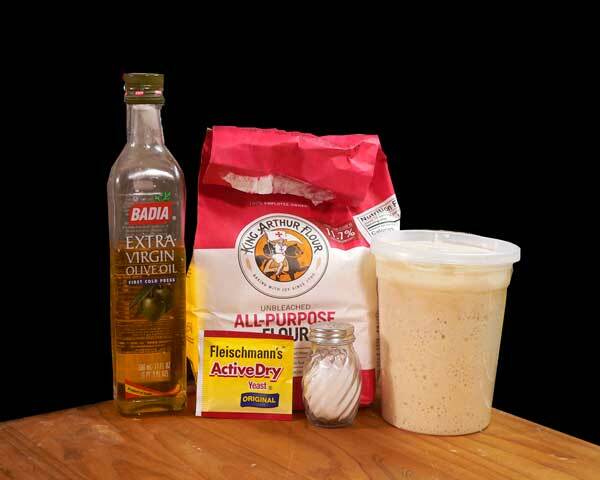 Homemade Sourdough Bread – You’ll need these ingredients. I’m using a “starter” that I made from scratch here at home. While I don’t have a step-by-step on how to do that here on Taste of Southern, I’m happy to share the link that I used to make mine. While they don’t have the photos of each step, King Arthur Flour does have the steps you’ll need to take each day to make your own starter. It takes about 7-10 days to get one going well. 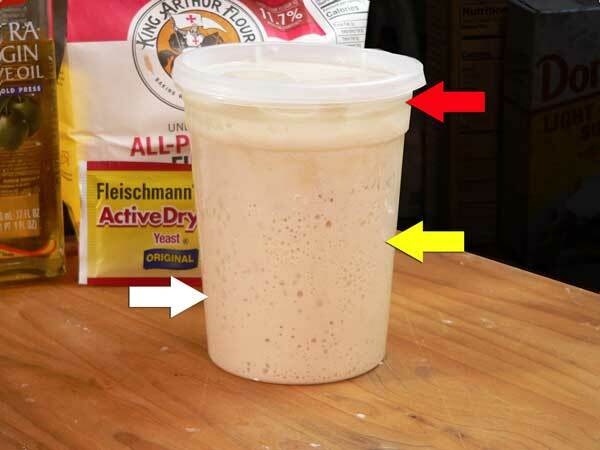 They have lots of information on their website about beginning, feeding, and maintaining your sourdough starter. I did use whole-wheat flour to get started with, and you’ll see that in the recipe for starting your own. They aren’t paying me to mention them, I’ve just been well pleased with the results. Smile. This is a closeup of the starter I’m using. The bubbles indicate it’s pretty active. The WHITE arrow on the left shows you the point that I start with my starter. I keep mine in the refrigerator, and only feed it once a week. The YELLOW arrow on the right, shows you about the level of the starter once I’ve added fresh flour and water and mixed it up. Then, I let it sit on top of my refrigerator to do it’s thing. The RED arrow on the right, shows the point to where the starter generally reaches when it’s at it’s most active point. Sometimes, it even lifts the lid off the top. Smile. The lid is just covering it and not pressed on tightly, but I’ve seen it rise up another half inch above the top a time or two. 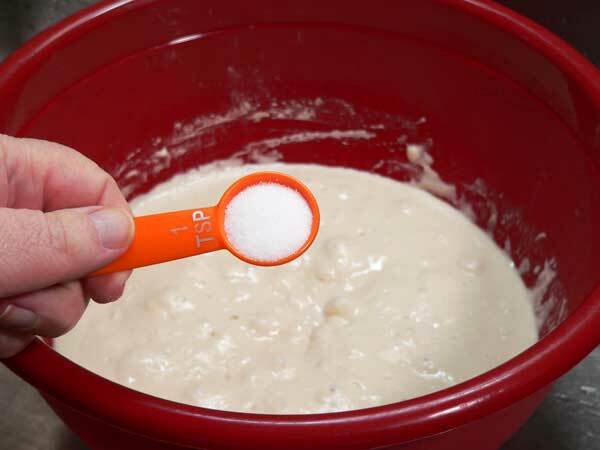 Once the starter has been fed and allowed to rise, it’s considered “ripe” and ready to use to make your breads. 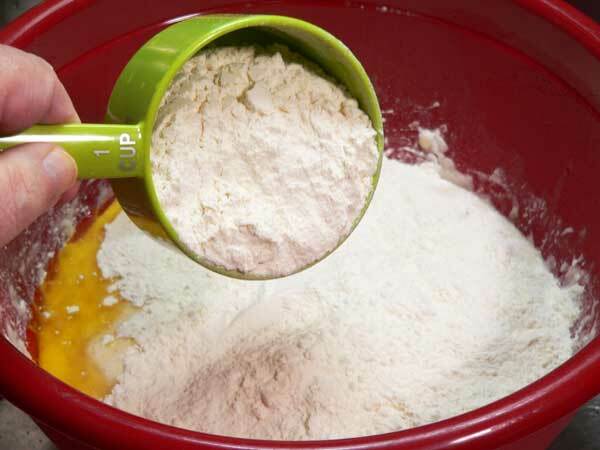 Grab a large mixing bowl and add the three cups of flour. Add the sourdough starter. It’s like a really thick batter at this point, but still pours pretty easily. Now, add the warm water. The water should just begin to feel warm to the touch, not hot. Next, grab a sturdy wooden spoon and mix everything together. 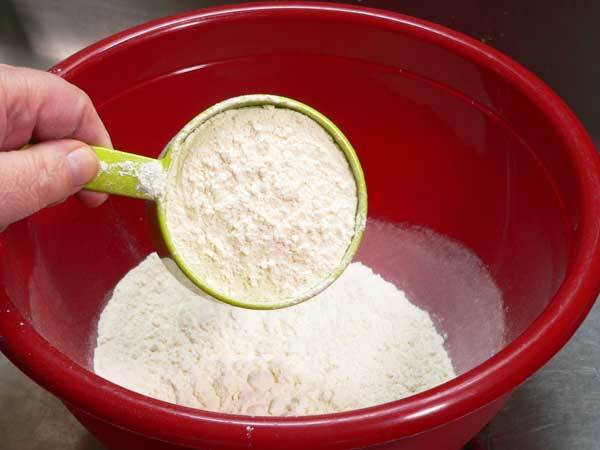 Scrape down the sides of your bowl, and be sure you’ve worked in the flour from the bottom of the bowl. This stage is called the “sponge”. Cover the bowl with a damp towel, and let this just sit for TWO HOURS at room temperature. Place the covered bowl in your refrigerator overnight, or for at least 12 to 16 hours. When I removed the “sponge” from the refrigerator, I let it sit at room temperature for about an hour, still covered with the damp towel. After that, I begin adding the other ingredients. 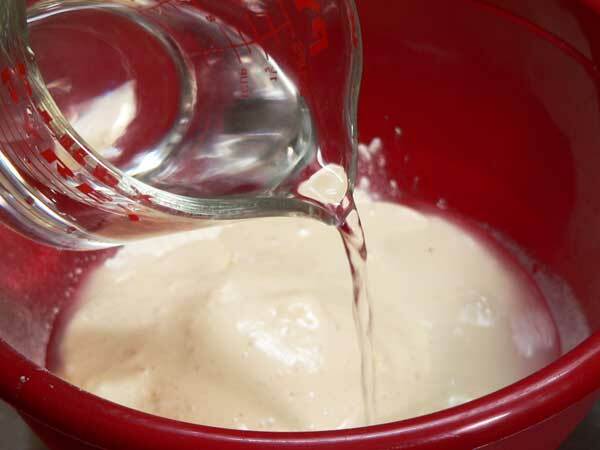 Add the yeast, but don’t pour it directly on the salt, spread it around elsewhere. The salt can slow down or even kill the yeast in some circumstances. Add about two cups of the remaining flour. The recipe calls for 5 -1/2 cups of flour total. We used three to begin with, now we’re adding two more. Reserve the rest to be used later if the dough is still sticky. Pull the wooden spoon back out and use it to mix all of these ingredients together. The dough should be pulling away from the sides of the bowl and still a bit sticky, but not wet and sticky. Add a bit more flour if you need it. Lightly flour your counter top or the surface you’ll be using to knead the dough on. 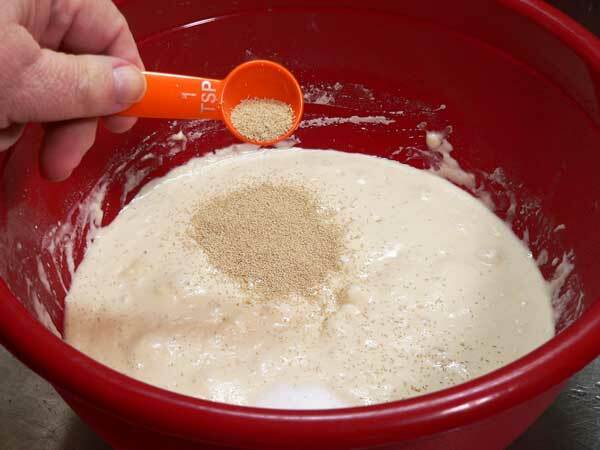 Turn the dough out of the bowl and onto the board. Lightly flour your hands, and use them to begin working up the dough. 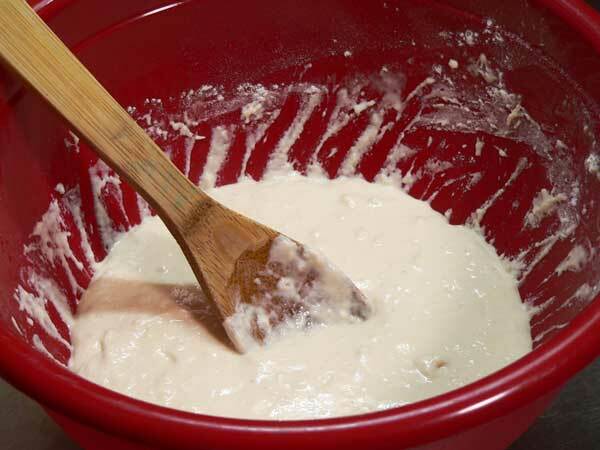 Just keep mixing and turning, gradually adding a bit more flour if needed, until the dough can be moved about without sticking to your hands or to the board. 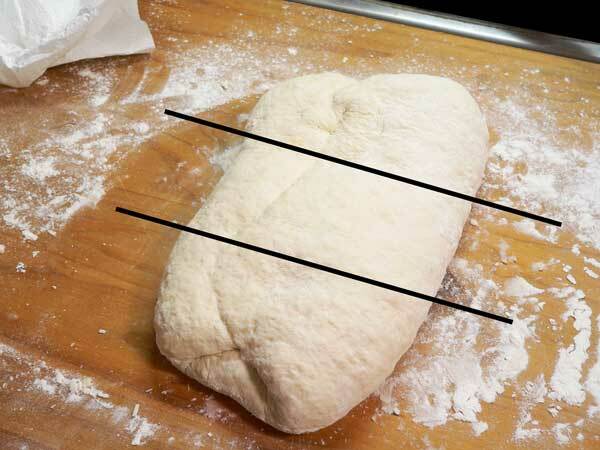 Shape the dough into an oblong like I’ve pictured above. It’s time to knead it a few minutes. Think of this oblong in thirds. 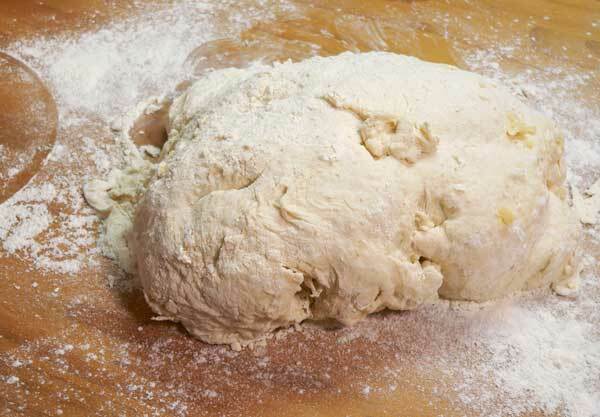 You’ll find lots of videos online to show you some great techniques on how to knead dough. Kneading is basically folding and pressing the dough over on itself to fully mix the ingredients and to build up strength in the dough. This builds up gluten in the dough, which helps make it light and airy. Without this, the bread would be flat and tough. Some breads require longer kneading times than others. Lift the bottom edge of the bread, and fold it about a third of the way up over the rest of the dough. 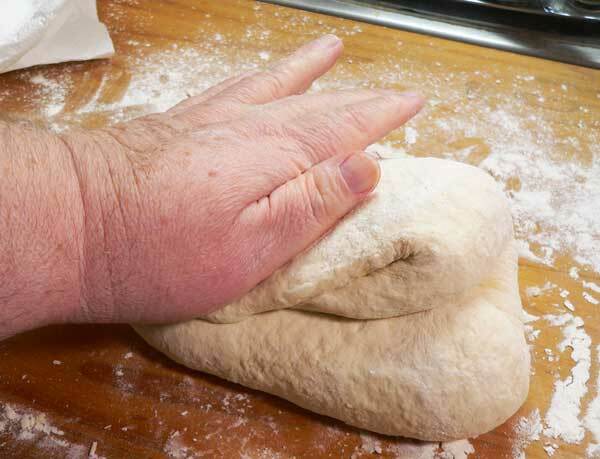 Use the heel of your hand to press the dough together. Fold the top third of the dough down over the rest of the dough. Again, use the heel of your hand and press this together. 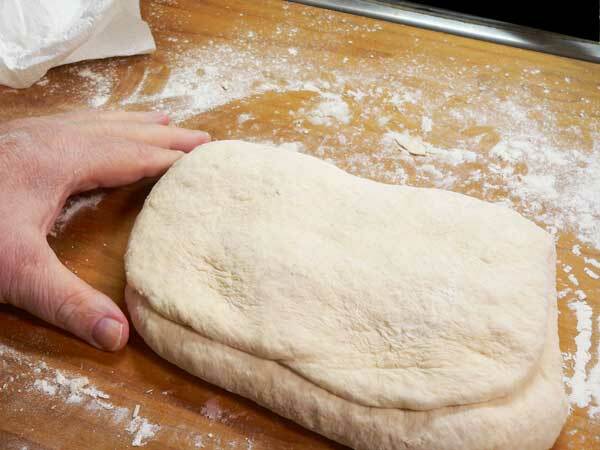 Continue to press with your hands, until you work the dough out into an oblong shape again. Turn the dough around on the board until it’s back in this position. Then, just keep repeating this process of folding, pushing, turning, until the dough is smooth. 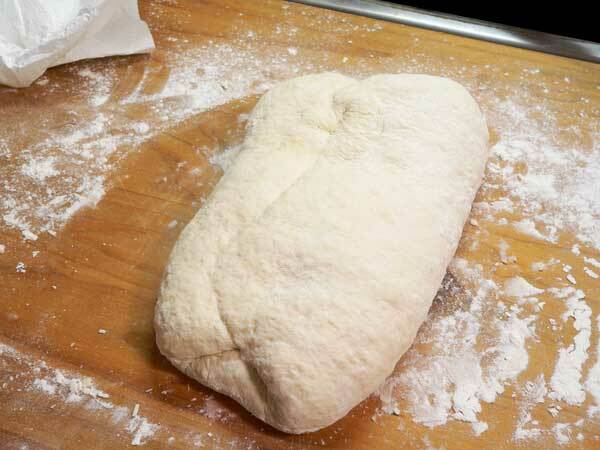 You can add a little more flour as needed both on the dough itself and on your board to keep it from sticking. I only did this for about five minutes. It’s a bit tiresome and all my hands could take. Smile. The dough should be smooth, and should spring back when you push your finger into it slightly. If it’s too stiff, add a little bit more water and work that in to soften it. Pinch the bottom of the dough together and shape it into a ball. 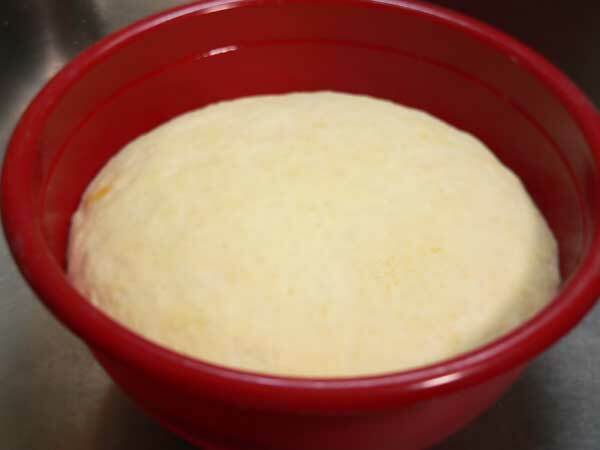 Place the ball of dough in a lightly oiled bowl. I drop the dough in with the smooth top side down, then flip it over. This puts a little bit of oil on the top of the dough to keep it from drying out. 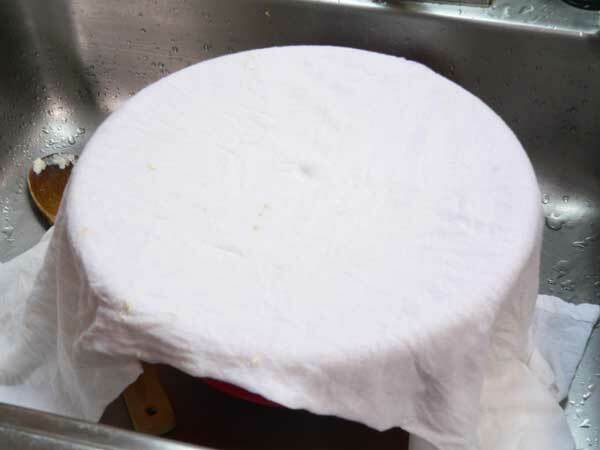 Cover the dough with plastic wrap, or just place the towel back over the top. Let this sit at room temperature for TWO HOURS. If all is going well, after two hours you should see your dough has risen and is puffy. Good job. Take your hand and just punch down into the middle of the dough to deflate it. 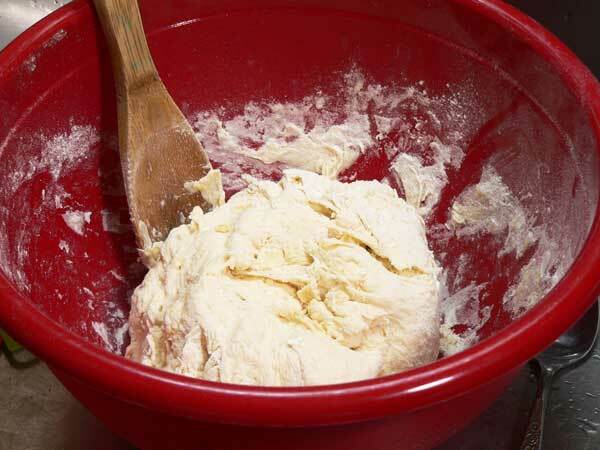 Lightly flour your counter top or board once again, then turn the dough out of the bowl and onto the board. The dough may be slightly sticky on top at this point. 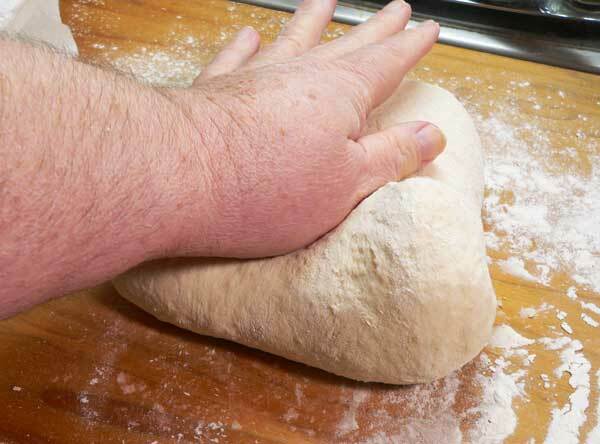 You can add just a light coating of flour on your hands and to the dough to keep it from sticking. 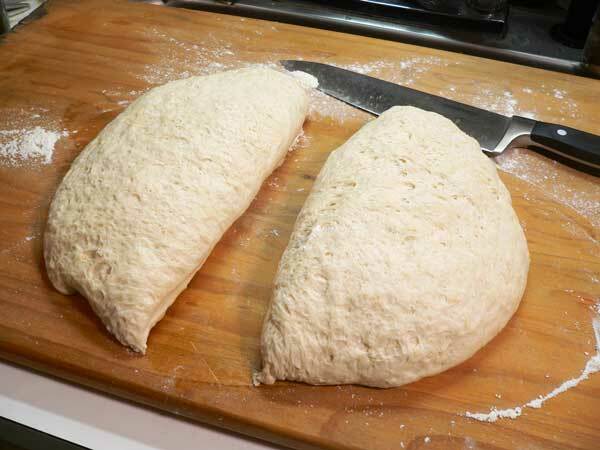 Use a sharp knife and divide the dough in half. I never seem to quite get it evenly divided though. Smile. 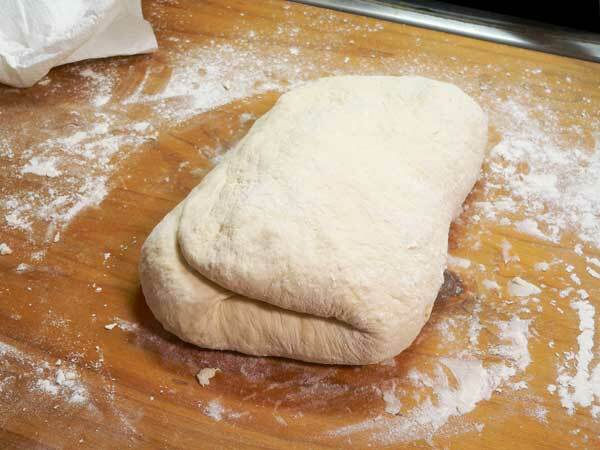 Fold the edges of the dough up under itself and pinch it together. 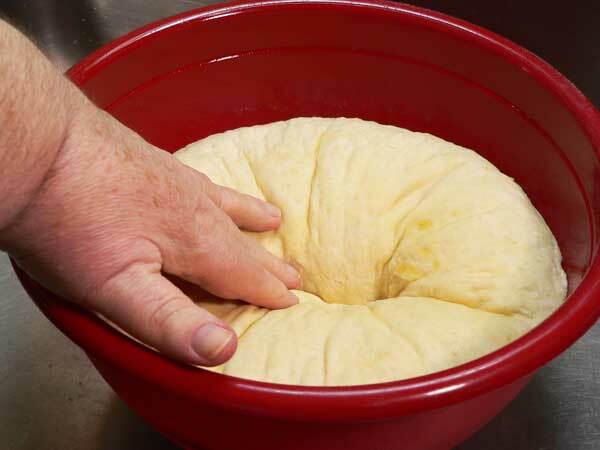 Work the dough with both hands to shape it into a round. Do this with the dough on the board as opposed to holding it in your hands and trying to shape it into a ball. Just tuck the bottom edges under, turn it a couple of times, and you’re done. Do both halves this way. Lightly oil a large baking sheet, then sprinkle the surface with a small amount of corn meal. Any kind of corn meal will do. This will keep the dough from sticking to the pan. My dough would probably have been a lot smoother had I been able to hold out to knead it longer. Old age does have some drawbacks you know. Smile. Now, cover the dough once again with the towel and let it sit for at least one more hour, maybe more, until the dough has a chance to rise again. Pre-heat your oven to 425F degrees. You want your oven to be good and hot when you put the loaves in to bake. As you can see, these two puffed up nicely. At this point, you should be able to press lightly into the side with one finger and leave an indentation in the dough. If it quickly springs back, cover it and give it a little more time to rise fully. Once the oven is hot, and just before you place the loaves inside, you need to slash the tops of each loaf. Most bakeries use something called a “lame” which is pretty much just a razor blade on the end of a stick. A really sharp knife works just as well. I’m using a case cutter that has a razor edge to cut three slash marks in each loaf. The slash should be about 1/2 inch deep. This will help the dough to rise more once it’s in the oven. In olden days, when folks would carry their breads to the community baker to have them baked, they would cut a different design of slash marks in their loaves so they could tell which one’s belonged to them. Place the baking sheet on the middle rack in your oven. Let the bread bake for 20 to 25 minutes, or until it’s done. You could use the toothpick method, or just a tapping on the bottom of the loaf to see if the bread is done. If you tap the bottom and it sounds hollow, it’s probably done. 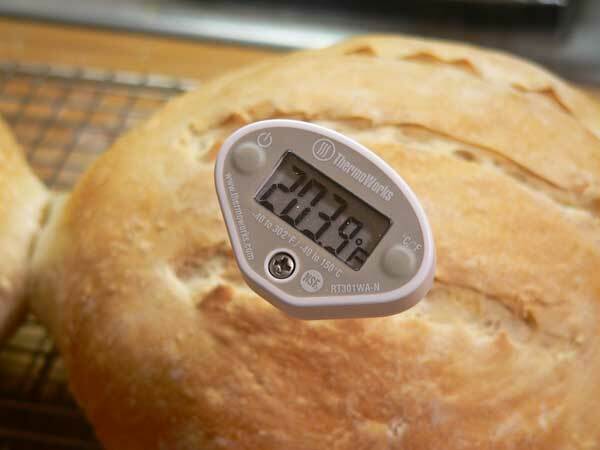 However the best way for us beginners, is to use a digital thermometer. I slipped this one into one of the slashes I’d made in the bread and pushed it down to about the center of the loaf. The bread is done when the internal temp falls between 190F and 205F degrees. It took me 20 minutes to bake this loaf up to 205F degrees. When it’s done, remove the bread from the oven and slide the loaves out onto a wire rack to cool. The bread should be allowed to cool completely, or just until it’s slightly warm. 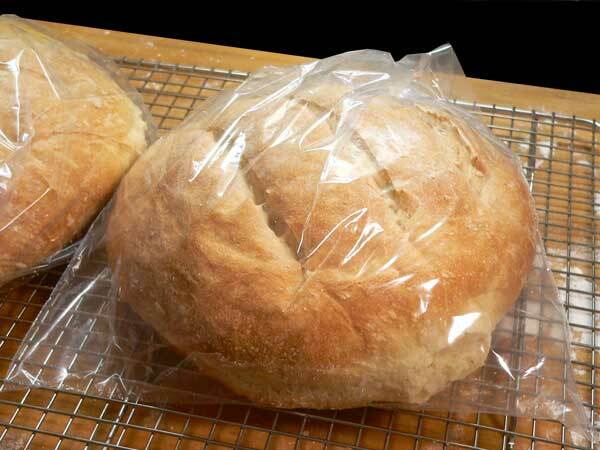 When it’s completely cool, you can store the loaves in plastic bags. Stored lightly wrapped, this sourdough bread should last 3-4 days. You can also wrap it tightly in plastic wrap and freeze it for up to three months. I’d suggest you wrap it in the plastic wrap, the wrap it in aluminum foil for best results. Please note that fresh out of the oven, the bread will have a hard crispy crust. After being stored in the plastic wrap, it gets much softer. Smile. 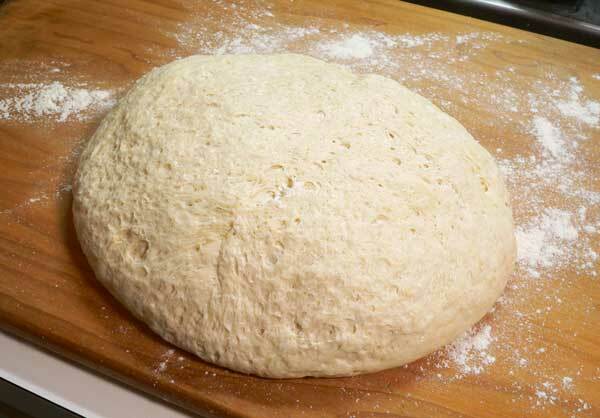 As you can see, this dough has a fine texture unlike some Artisan type breads that have large holes in them. The olive oil and the starter cause this, and helps keep the bread fresh for a little while longer. Smile. Sourdough Bread made from scratch using a homemade starter. 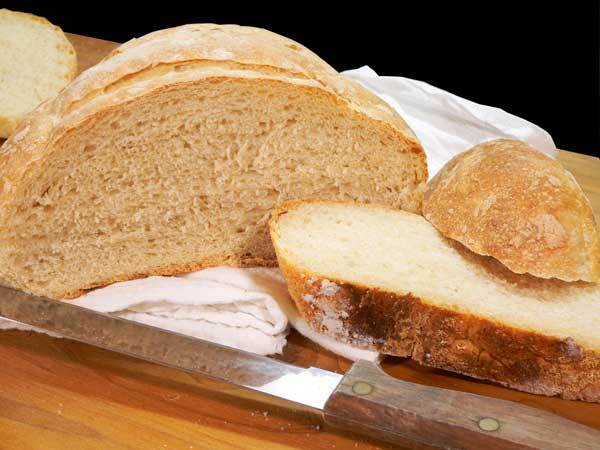 This finely textured loaf will stay fresh longer due to the starter and olive oil. Makes two loaves. Day One: Place 3 cups flour in a large mixing bowl. Add the cup of sourdough starter. Add warm water. Water should be slightly warm to touch, not hot. Use a large wooden spoon to stir everything together. 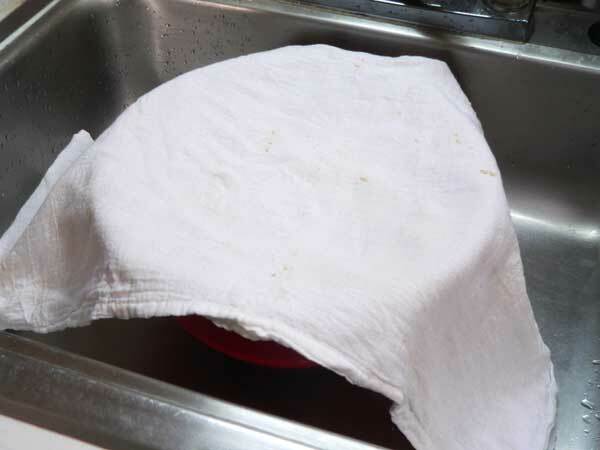 Cover the bowl with a damp towel. Let sit at room temperature for two hours. Place covered bowl in refrigerator overnight or for at least 12-16 hours. Day Two: Remove dough from refrigerator. Let sit on counter for one hour. Add about two cups of the remaining flour. 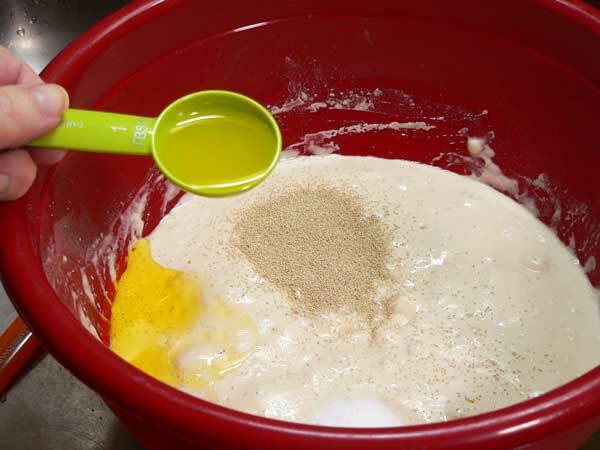 Stir together with wooden spoon to make a soft dough that cleans the sides of the bowl. Turn dough out onto lightly floured work surface. Knead the dough for about 5 minutes, or until it’s smooth and springs back when you poke it. 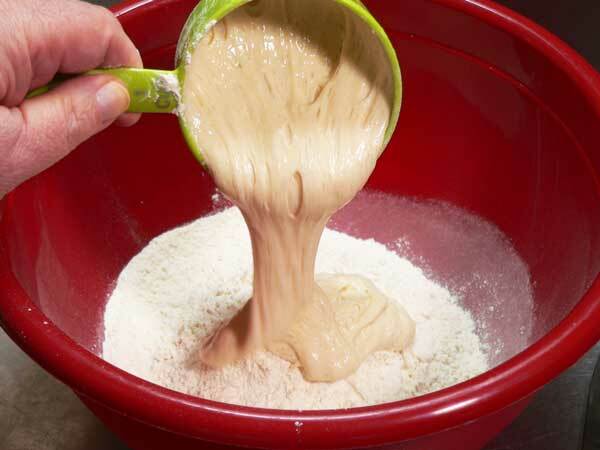 Gradually add more flour if your dough becomes sticky, or a little water if dough is tough to soften it. 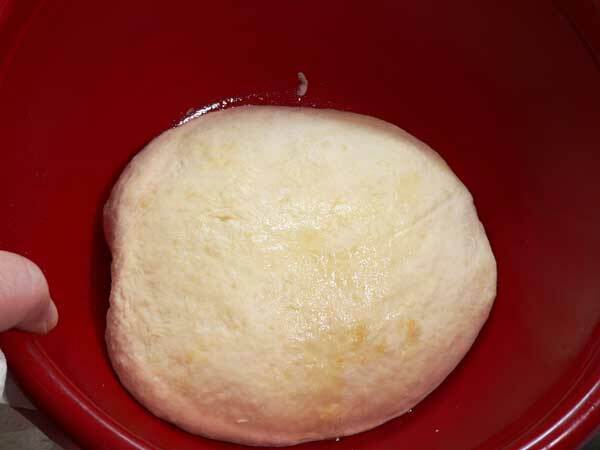 Lightly grease a bowl with olive oil and place the ball of dough in the bowl. Cover bowl with plastic wrap or towel and let sit for two hours to rise and become puffy. Punch the dough down to deflate it. Place ball of dough on lightly floured surface. Shape each piece of dough into a round ball. Pinch the bottom edges together until sealed. Lightly oil a baking sheet, then lightly sprinkle with corn meal. 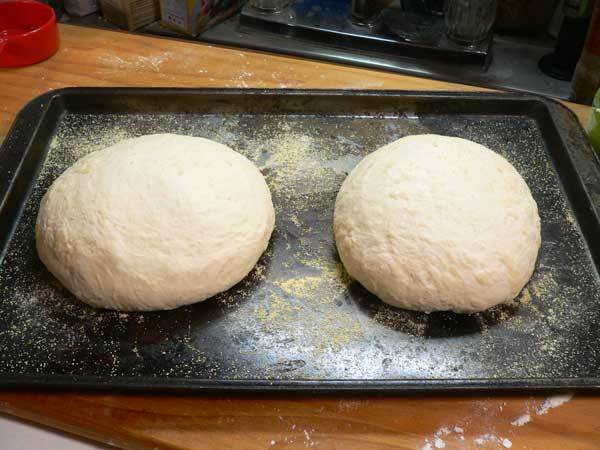 Place the two dough balls on the baking sheet, leaving space between them as possible. 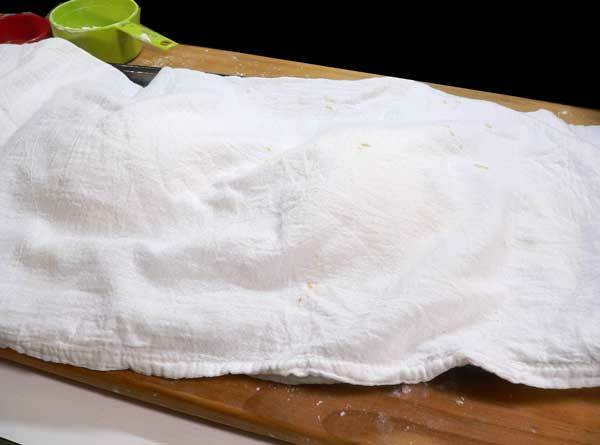 Cover the dough balls with a towel again and let sit for one hour to rise. Dough should be puffy and a finger pressed into it will leave a mark. 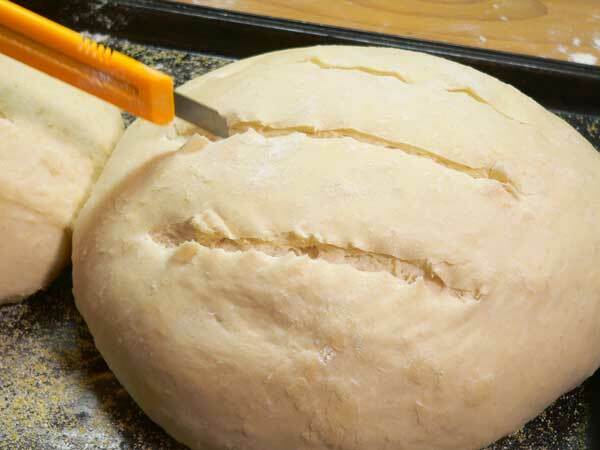 Slash the dough with a razor blade or sharp knife, three times across the top. Place pan in pre-heated 425F oven for 20-25 minutes or until bread is done. Test for doneness by tapping bottom of each loaf. If it sounds hollow, it should be done. You can also test with a digital thermometer. Bread should bake to 190F to 205F degrees to be done. Remove from oven, slide loaves onto a wire rack and let cool. Slice as desired when cool or just slightly warm. This recipe makes two loaves. 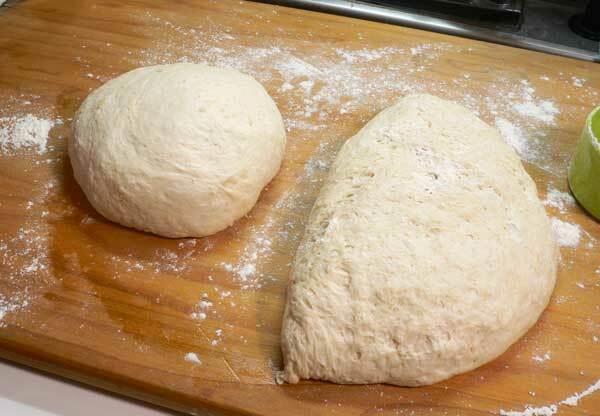 If desired, divide the dough into thirds to make bread bowls for soups and chowders. A fresh starter is needed to make this sourdough bread. 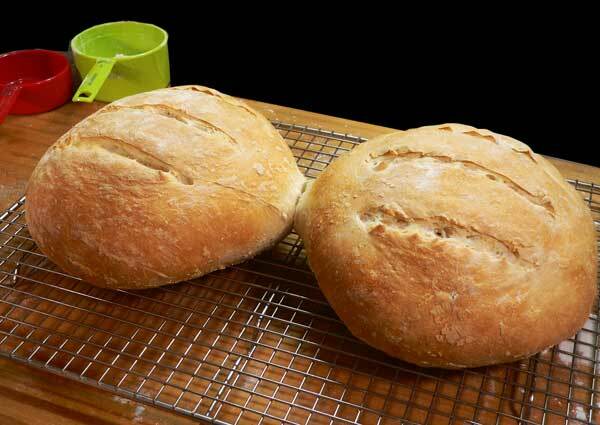 Have you ever made Sourdough Bread from scratch? How did it turn out? Share your memories of this favorite bread with us. It will only take a minute or two for you to leave your comments in the section below. While you’re here, be sure to sign up for our totally FREE NEWSLETTER. I’ll send you an Email every once in awhile to remind you when I post a new recipe, or when anything else of importance is going on around Taste of Southern. It’s totally free, and super easy to sign up. And, should you ever decide that you are no longer interested, it’s even quicker to unsubscribe. How cool is that? I’ll be looking forward to seeing you add your name to our list. The signup box is below and you’ll also find one in the top right hand corner of each page. I hope you’ll do it today. Id really like to try making sour dough starter again. I’ve never had it work for me. Every time it just sits there. My Sister -in-Law makes wonderful bread. Wish I could also. I really enjoy reading your newsletter and trying a recipe from time to time. Your Mother’s cooking reminds me so much of my Mother’s. We may be related! HaHa! I use a “No knead Sourdough Bread” technique and like the results. I refer to it as a Senior Citizen’s best friend! If your are interested try https://breadtopia.com/sourdough-no-knead-bread/ for technique and video. I make our bread every week. I used to make sour dough but lost my starter when my home burned down 3 years ago and never got another one started. I need to get going on that. Right now I make white sandwich, 100% whole wheat and 100% rye sandwich bread. Just made bread yesterday so if I get my starter going, my next loaf can be sour dough bread. Thanks for reminding me of this wonderful bread.